The Billion Dollar Spy: A True Story of Cold War Espionage and Betrayal | Your #1 Source for Kindle eBooks from the Amazon Kindle Store! While driving out of the American embassy in Moscow on the evening of February 16, 1978, the chief of the CIA’s Moscow station heard a knock on his car window. A man on the curb handed him an envelope whose contents stunned U.S. intelligence: details of top-secret Soviet research and developments in military technology that were totally unknown to the United States. In the years that followed, the man, Adolf Tolkachev, an engineer in a Soviet military design bureau, used his high-level access to hand over tens of thousands of pages of technical secrets. His revelations allowed America to reshape its weapons systems to defeat Soviet radar on the ground and in the air, giving the United States near total superiority in the skies over Europe. One of the most valuable spies to work for the United States in the four decades of global confrontation with the Soviet Union, Tolkachev took enormous personal risks—but so did the Americans. The CIA had long struggled to recruit and run agents in Moscow, and Tolkachev was a singular breakthrough. Using spy cameras and secret codes as well as face-to-face meetings in parks and on street corners, Tolkachev and his handlers succeeded for years in eluding the feared KGB in its own backyard, until the day came when a shocking betrayal put them all at risk. Drawing on previously secret documents obtained from the CIA and on interviews with participants, David Hoffman has created an unprecedented and poignant portrait of Tolkachev, a man motivated by the depredations of the Soviet state to master the craft of spying against his own country. 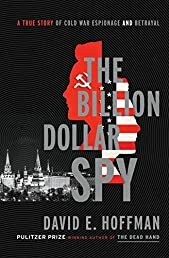 Stirring, unpredictable, and at times unbearably tense, The Billion Dollar Spy is a brilliant feat of reporting that unfolds like an espionage thriller. The Spy's Son: The True Story of the Highest-Ranking CIA Officer Ever Convicted of Espionage and the S..